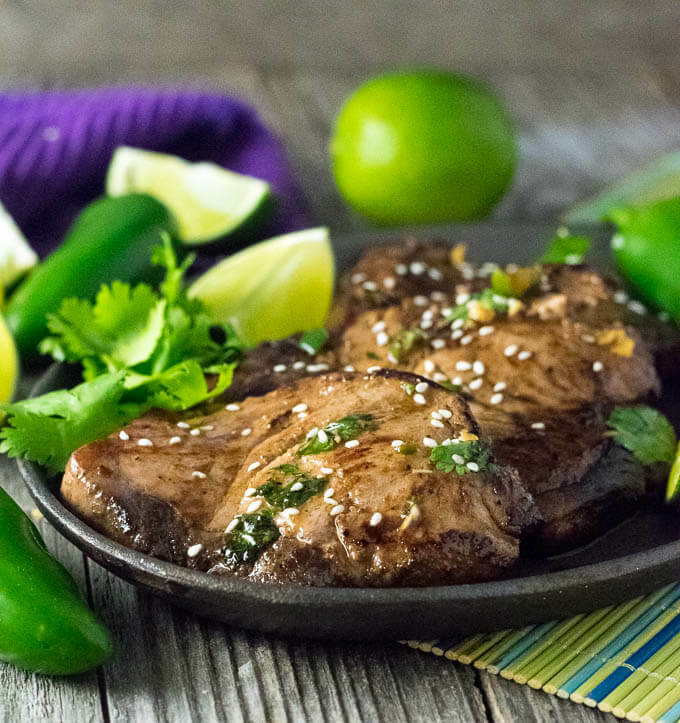 Serve up healthy fresh seafood for dinner with these lively Marinated Tuna Steaks gently soaked in soy, lime, olive oil, and seasonings. I recently came upon a bounty of fresh tuna steaks. Now, I’ll be honest, I am too cheap to typically buy them for myself, however, my brother-in-law recently went deep sea fishing and between him and his fellow boat-mates, they purported to catch a market value of $11,000 worth of fresh tuna. Now, I am no fishmonger, so I can’t verify that exactly, but fishermen would never lie, right? My wife doesn’t like seafood, and my young children aren’t crazy about its flavor either, so I am tasked with consuming these delectable steaks all by myself. Isn’t life rough? Normally I would insist on my children eating it too, but that rule goes out the window once the price exceeds $10 a pound. Tuna is an exceptionally mild flavored fish, making it ideal for taking on the flavors of a marinade. Though you can simply season tuna and brush it with olive oil, I think you will find marinating to be the best way to enjoy tuna steaks. In particular, Asian flavors pair wonderfully with tuna. 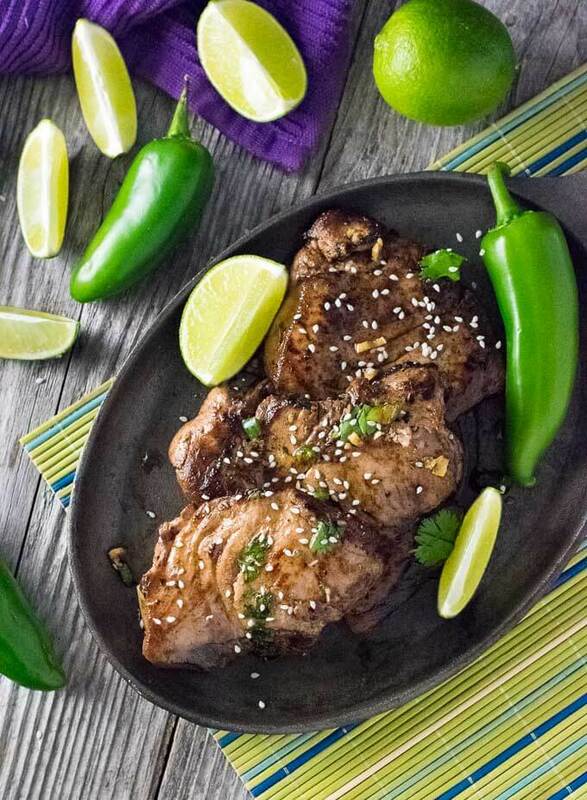 My tuna steak marinade recipe plays off of an Asian theme by featuring soy sauce, lime, and olive oil. 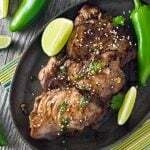 I add a chopped jalapeno for a subtle kick, although that can be omitted if you are heat-adverse, however, the sweetness from the dash of sugar does provide balance to the mild heat. It doesn’t take long for the tuna to soak in the flavor of the marinade. I think 30 minutes to an hour is the sweet spot, but more generally 15 minutes – 2 hours is what I aim for. You do not want the tuna steaks to sit in the marinade for an excessive amount of time or the acids will ruin the texture of the fish, similar to making ceviche. High-quality tuna is meant to be enjoyed rare. Ideally, you want to sear the tuna while leaving the interior perfectly pink. Overcooking tuna leaves it dry and flavorless. To achieve perfectly cooked tuna steaks you will want to employ a ripping hot skillet. The aim is to quickly cook the exterior before the interior heats up excessively. I like using cast iron (affiliate link) for this. On most stoves, medium-high heat should be sufficient, but don’t be afraid to go hotter if needed. Be sure to add a generous swirl of oil into the pan, as this will help with browning. The tuna only will require a couple of minutes per side. OK, so you are all set to serve your Marinated Tuna Steaks to your adoring family, but what should you serve with it? Aim for a light side dish, nothing too heavy. My Mexican Street Corn Salad, Honey Roasted Beets, or Coconut Milk Rice with Pineapple would all be flavorful accompaniments. Even something as simple as oven roasted asparagus would be appropriate. Combine all ingredients of the marinade and whisk together with a fork. Place tuna steaks in a gallon zip-lock bag and add marinade, reserving 1 tablespoon. Let marinade for 15 minutes - 2 hours. Add cooking oil to a heated skillet set to medium-high heat. When oil is heated and shimmering add tuna steaks. Cook for 2-3 minutes per side, aiming to sear the exterior while the interior remains pink. 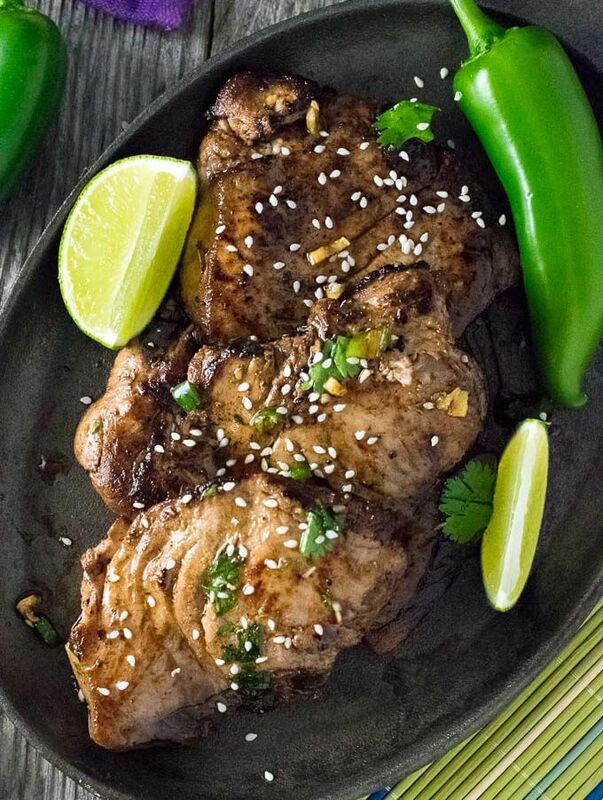 Remove from skillet and let rest for 5 minutes, spoon over the remaining tablespoon of marinade if desired, sprinkle with sesame seeds, then serve. IF YOU LIKED THIS RECIPE be sure to check out my Grilled Chipotle Shrimp recipe too! 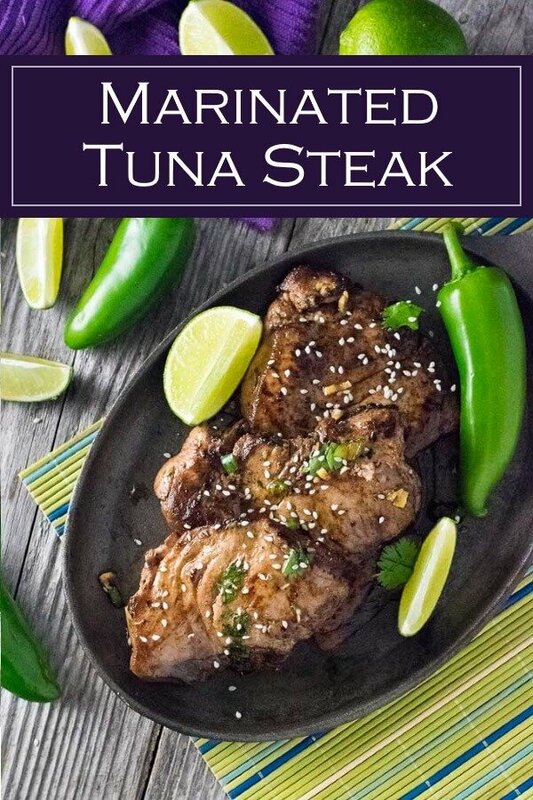 If you enjoyed reading my Marinated Tuna Steaks recipe then you should probably like me on Facebook and follow me on Pinterest too. That’s what I would do at least, because if you don’t get to know me but you still use my recipe it is kind of like taking candy from a stranger, and your mom taught you not to do that. Don’t disobey your mom, subscribe to Fox Valley Foodie today. This is now my favorite way to prepare tuna steaks! My favorite recipe for tuna steaks too.